"The heavens declare the glory of God, and the firmament shows His handiwork. Day unto day utters speech, and night unto night reveals knowledge" (Psalm 19:1, 2). "There is nothing beautiful and delightful in the skies or on the earth, which is not in some way representative of the Lord's Kingdom" (AC 1807:2). This book of studies and papers is the product of the Correspondences Committee. In the April, 1990 issue of the "New Church Teacher" there was an article entitled: "More Excellent Than All Other Sciences" (NJHD 261). This article evoked a response by a number of New Church teachers. In early September of 1990 the Academy president gave an address entitled: "The Science of Correspondences and the Academy Curricula." There was also a responsiveness to this, and these two presentations led to the formation of a voluntary committee: the Correspondences Committee. It is a subject that seems to appeal to both the imagination and the love of doctrine. Our committee has met eight times and each gathering has led to new insights and discoveries. There is a serendipity, synchronicity factor here: a number of New Church scholars apart from this committee, and members of the committee, have recently been writing upon or studying this subject. In August of 1991 our committee held a two day seminar at the Swedenborg Library in Bryn Athyn. We reviewed something of the doctrine and philosophy of correspondences, and then discussed how we could apply this subject effectively in the curriculum. This booklet is a product of that 1991 summer seminar, and also of our eight meetings. Its purposes are twofold: to help clarify the doctrinal philosophy of correspondences, and then to seek effective applications in the classroom. This is only a beginning attempt. Real success will come as New Church teachers believe in the vision, and discover their own effective applications. The contributors of these articles are listed in the table of contents. If you have concepts about the philosophy of correspondences, or new application ideas, please write to us. We would like to keep this work going! Maybe we can rediscover some of the wonder that moved members of the Ancient Church, and the awe that touched the hearts of the Most Ancients. To this we can, hopefully, add the beauty of the detailed correspondences revealed in the Heavenly Doctrines. Please join our adventure! The Lord reveals: "the science of correspondences is more excellent than all other sciences, since without it the Word is not understood...; neither is it known what the spiritual is, nor in what manner spiritual influx takes place into what is natural, with many other things" (NJHD 261). "More excellent than all other sciences" (Ibid)! The Lord is not speaking here of the past, but of the present and the future. What a challenge this is to New Church education: to the further discovery of distinctive courses. How can we introduce the science of correspondences and representations livingly into our curricula? There have been a number of pioneer efforts in this' direction, and they have had strong impact on students' hearts and minds. But how can we go further? Aren't we just in the infancy of such efforts? One thing is touchingly clear: in order to see truly the role of correspondences in New Church education, the start must be from charity. It is the innocence in charity that opens the mind to the wonders of the Lord's creation, and to the manifold images of Him. Charity's insights and perceptions are not simplistic. Rather, they are founded upon doctrine and scientific scholarship, and are both realistic and truly rational. Charity, which is from the Lord alone, is open to the wonder and beauty of God's creation. In states of openness we see the sparkle of the ocean, the beauty of great mountains, the delicacy and rainbow brightness of a garden, and we know: the Lord is here. He is present in these correspondential images. And in other states of openness, we can see the Lord's presence in the correspondences of the human body and its functions, in the scientifics of mineralogy, in the complexity and efficiency of photosynthesis, in a variety of natural operations. In The True Christian Religion it is stated that "one of the universal knowledges for understanding creation is that there is a correspondence between things of the spiritual world and. those in the natural" (TCR 75:5). Complementing this universal thesis is the teaching that "correspondences have all force, so that what is done on earth according to correspondences has power in heaven; for correspondences are from the Divine. Those who are in the good of love and of faith are in correspondences, and the Divine effects all things with them... All miracles in the Word were effected through correspondences. The Word is so written that every minute thing therein corresponds to the things in heaven; hence the Word has Divine force, and conjoins heaven and earth" (AC 8615:3). It is easy to record these teachings. But a relaxed reflection upon them reveals their extraordinary impact. the Divine was linked to the natural world, and the natural world linked to the Divine" (AC 3702). Crucial to this living linkage is the science of correspondences. One plane is joined to another, from firsts to lasts and back to firsts, through influx and correspondences. Correspondences are a key. This Divinely ordained linkage in creation was perceived by the Most Ancient people. "The objects which they saw with their eyes were so to speak images of that (inflowing) life; and although these images were inanimate, they were nevertheless animate to those people. This is the kind of perception that celestial angels have of everything in the world..., and it is also the source of the kind of perception which young children have" (AC 3702:2). Nature, creation, are alive to little children, as they were to people of the Golden Age. Can something of this be recaptured? Can it be recaptured not only as a science, but as a poetry of the heart? To little children, nature around them is alive. So too are their toys and playthings. Children have a sense of wonder and awe that we have perhaps forgotten. It is like Joseph of the Old Testament, whom his brothers thought to be dead. It is interesting that in moments of high crisis, in near-death situations, the perception of nature and creation being alive can return. To soldiers going into battle, facing death, there is an exquisite sensitivity to creation being alive. Unrecognized but present is an openness to wonderful correspondences in creation. How can we bring something of this spiritual reality to our curricular offerings? How do we lead ourselves and our students to an awareness of the Divine Creator within His creation? One of our researchers writes: "I think that correspondences may be the real core of distinctive New Church education, in that they are the means through which the Lord accommodates His Human to individual human minds. He does this through the objective reality of the senses which activates the internal human which perceives (the soul and the human mind). Perhaps even more important in the long run are the life skills which can be developed through better understanding of correspondences. They are really the essence of communication. Therefore the greater our understanding of the power of symbols, in words and "body" language, the keener will be our ability to share our humanity with one another" (Mrs. Sanfrid Odhner). Professor Erland J. Brock adds his own perspective to this. In the conclusion of his article in the New Philosophy on the subject of "Correspondences of Photosynthesis" (January-March, 1986), he writes: "... this attempt to apply the doctrine of correspondences to an aspect of nature follows other recent efforts along these lines published in this journal. What purpose does this kind of thinking serve? We suggest two. "First, thinking from correspondences may provide a new frame of thought from which to think about the world and its workings, thereby providing new hypotheses to serve as the starting points for the scientific study of nature. Second, because our essential character is spiritual we should not let our thought be constantly immersed in the material -- for rampant materialism is destructive of our truly human qualities. If, therefore, in thinking about nature we can go beyond the mere contemplation of its wonderful material reality that science reveals, and think as well of these same images as some aspect of our essential spiritual character, our thought can be elevated to the contemplation of eternal values and thereby enriched." A minister and former Academy teacher writes: the subject of correspondences/goes right to the very heart of the development of a New Church curriculum ... I believe this is the very path by which the New Heaven is to descend to earth." And if this seems like too strong a statement, reflect upon what the Lord has revealed in His Word: "from external things a person may see internal things, that is, ... from objects existing in the world he may reflect continually on things that exist in the next life, for it is for the sake of that life that he lives in the world. Such was the sight of the Most Ancient Church; such is the sight of the angels who reside with man; and such is the Lord's sight ... For not one thing of beauty and delight ever exists in the sky above or earth beneath that is not in some respect representative of the Lord's kingdom" (AC 180 6,7 sel). I suggest the Writings ask us to restore the science of correspondences as "the science of sciences" (NJHD 261). In a universal perspective, this is one response to the Lord's call for the New Church: "Behold, I make all things new" (Rev. 21:5). Functional use of correspondences will be "new" in the sense that this science will be applied in a new way. We are told that "the most ancient people on our earth, who were celestial people, thought from correspondences themselves, the natural things of the world before their eyes serving them as means of thinking in this way; and ... they could be in fellowship with angels and talk with them because they so thought... But after this there followed a period when people thought, not from correspondences themselves, but from a knowledge of correspondences, and there was then also a conjunction of heaven with a person, but less intimate. This period was called the Silver Age. After this there followed people who had a knowledge of correspondences but did not think from that knowledge, because they were in natural good, and not, like those before them in spiritual good. This was called the Copper Age. After this man gradually became external, and finally corporeal, and then the knowledge of correspondences was wholly lost and with it a knowledge of heaven and of many things pertaining to heaven" (H. 115). My suggestion is that this overall decline will now be reversed. From natural good, the Lord will lead the Church into spiritual good. Then we can think again from a knowledge of correspondences, and with this we will again be conjoined with heaven. And eventually, as people of the New Church regenerate, we will gradually learn to think again from correspondences, as did the Most Ancients. But there will be a difference. In His First Coming, the Lord Jesus Christ glorified His Divine Natural, and in His Second Coming He revealed the qualities of this Divine Natural. From this Divine Natural "not only is the internal spiritual person enlightened, but also the external natural; and unless these two are simultaneously enlightened, a person is as it were in shadow; but when both are enlightened, he is, as it were, in the light of day" (TCR 109). As New Church people regenerate, and as they develop both the natural sciences and arts, and also their ability to think from a knowledge of correspondences and then from correspondences themselves, a quiet miracle will occur. More and more we will see the Lord in His Divine Human, standing before our eyes. We will see Him standing forth in correspondences in every realm of His creation, and from this perceive more and more of His direct presence with us. We will see Him more deeply in His Word. And also His creation will open up to us more and more, so that "The heavens declare the glory of God; and the firmament shows His handiwork. Day unto day utters speech, and night unto night reveals knowledge .... From the end of the heavens is His going forth, and His circuit unto the ends of them; and nothing is hidden from His heat" (Psalm 19:1-3,6). A doctrine is an ordered set of teachings about a topic, and there are two types of doctrines. Most doctrines are subject doctrines, such as the doctrine of the Lord, the doctrine of the Word, and the doctrine of regeneration. Tool doctrines are doctrines that are applied to the subject doctrines with the result that the subject doctrines are better understood. Each tool doctrine has its own set of teachings about itself (e.g., the doctrine of correspondences), but its purpose is to throw light on doctrines that contribute more to personal salvation. Based on the five sections of Divine Love and Wisdom, there are five tool doctrines: 1) the doctrine of order; 2) the doctrine of influx; 3) the doctrine of degrees; 4) the doctrine of forms (of use); and 5) the doctrine of correspondences. The subject of the first section of Divine Love and Wisdom is God, but to relate Him to His creation the doctrine of order is presented. The subject of the second part is the spiritual sun, and to understand it and its role in creation the doctrine of influx is presented. The doctrine of degrees is presented in the third section because the subject there is spiritual and natural creation both of which exist in degrees. The fourth section presents the doctrine of forms for this section discusses the process of creation with attention given to what is created in both realms. The fifth section is about the greatest achievement in God's creation, human beings, and in discussing the essential parts of humanity, the will and the understanding, the section uses the doctrine of correspondences to give a living comparison between the two mental receptacles and the heart and lungs in the body. When a person has a working knowledge of these tool doctrines, and especially if he has an understanding of them, he is better able to know, understand and appreciate any and all of the subject doctrines. For example, the more he knows about order, influx, degrees, forms and correspondence the more he can know about the Lord's creation, salvation, glorification, etc. Also, he then is able to know more about Divine revelation, human regeneration, the establishment of conjugial love, and the existence of the spiritual world and its relation to the natural world. Finally, the more a person knows about one of the tool doctrines, the more he can know about the other four because of the relationship among the five. So if a person wishes to know more about correspondences, it is useful for him to study the other four tool doctrines as well as the doctrine of correspondences. And any increased understanding of correspondences will produce a greater understanding of the other four tool doctrines. In the disciplined study of religion students are taught that the three most universal and important religious questions are these: What is God (or the Source of creation)? What is creation? And what is the human race? Every religious issue has to do with one or more of these. When a person understands the answers to these questions as they are answered by a religion and he understands how the questions relate to each other, then he truly understands that religion. One of the many advantages of the Heavenly Doctrines is their ability to answer these questions with clarity and fullness. And essential to this ability is its explanation of how correspondences work. The more a person understands this, the more he knows about the Lord, about spiritual and natural creation, about human beings, and about their relationships. There is a vital connection between the Lord and His creation, between the Lord and humans, between creation and humans, for all three are in human form which is the form of love and wisdom expressed in uses. And correspondence is this vital connection. If we take the teaching in Divine Love and Wisdom 13 seriously -- where it says that all we know and that where we spend eternity is determined by our concept of God -- then we realize the importance of developing a correct concept of Him. And this concept is possible because of His correspondence with His creation and the crown of creation, human beings. Also, without an understanding of the Lord based on a knowledge of correspondences we cannot truly know Him and so we cannot truly worship Him and develop a close personal relationship with Him. Less crucial is our understanding of mankind, and yet without a proper understanding we cannot really develop a genuine charity which is the love of the neighbor and its exercise, we cannot develop a fully healthy self-esteem, and we cannot understand the importance of taking care of the body and the mind at the same time. Least important for our spiritual welfare is our understanding of creation, and yet it too is important, for we need to know what heaven and hell are to make informed decisions, and it is useful to see creation as the theater of the Lord's dramatic performances and to see that this creation deserves our study and our care. Because of the correspondential interrelationship among these three subjects, as we understand one, we understand the others. In addition to these three basic religious issues are two other very important topics. The Writings indicate that there are five principal doctrines for the New Church (in this order): the Lord, the Word, regeneration, heaven and marriage. The doctrine of the Lord belongs to the first religious question, the doctrine of heaven belongs to the second religious question, and the doctrine of regeneration belongs to the third religious question. But we also need to appreciate the Word and marriage. For us to form an enlightened understanding and an enlivened awareness of the Word and of marriage, we need to understand the correspondences that form them. When we do this we appreciate the Word and marriage more and so they become a more active part of our lives. This is true for any subject: first we learn about it, then we understand it, then we appreciate its value, and then we apply it to our lives. A knowledge of correspondences is an essential part of the understanding of any significant subject. As a child I visited the Academy Museum on the fourth floor of the old library. One saw some curiosities there, but one also got the impression that the things had been sitting there untouched for a thousands years and that no one ever visited the place. The few lights scattered a dim illumination over the peeling paint and the crumbling plaster. The Indian arrowheads seemed to have migrated in amongst the Egyptian mummies and Gothic capitals. On the whole one came away fairly depressed. Although this is something of a caricature, in some ways it pictures my sense of the New Church as I grew up in Bryn Athyn and attended the Church schools. I realized that the Church had some curiosities to offer. But the general sense was of something old, dusty and neglected. The picture is overdrawn, of course, partly to make a point, partly because of the difficulty in recapturing the childhood feelings. But there must be some truth to it because I do recall clearly that it was with a definite sense of discovery that I began to find as I emerged from high school into college that the New Church is new and exciting. Something of such an evolution is inevitable; just as children so often go through the phase of finding their parents old-fashioned and boring. But New Church education needs to be directed at conveying the excitement as soon and as clearly as is possible. I discovered the excitement by returning to the museum, at least this was part of the story. The museum, had not changed, but I had. In Prescott Roger's Ancient History course I wrote a paper on the mystery of the origin of language, trying to sift through the Babelian confusion of tongues. In researching the paper I explored a dusty old book in the library about Egyptian hieroglyphics. Just as my interest was getting piqued, Aubrey Odhner gave an address to a General Faculty meeting entitled "The Search for the Ancient Word through Myth and Correspondence." I snuck into the meeting and I was hooked on the mysteries of correspondences. Within a few months I volunteered to do student work in the museum. On returning to the museum, I found it to be the doorway to many mysteries. The museum itself has now changed. It has moved to more impressive housing. The collections have grown and been properly organized. But above all it is alive and constantly being used. The excitement embodied in the museum is inspiring more people all the time. But the mystery is still there. How could it help but be, in the halls of a castle? Now I have spoken a lot about mystery, but not much about correspondences. So be it. I am going to continue to speak of mystery. What is the place of mystery in the New Church? Have not the mysteries of faith, at least, come to an end? The grand invitation over the doorway of the New Church is that we may now enter into the mysteries -- but not that they are simply now gone. The power of the mysteries is that they keep going on, no matter how far we enter into them. At the heart of mystery dwells the Lord. He reaches out to us through the mysteries, but we never pierce through to the center ourselves. What we need is to find and keep the drive to continue entering into the mysteries. Here is a Latin word: unio. Who knows what it means? Trick question. It can mean any one of three things. The meaning "union" is fairly obvious. It can also mean "onion." Shipley's Dictionary of word origins says: "The idea is that the many, many layers make but one sphere... The onion has been used as a symbol, in that, far as you peel, you never reach the core." In a sense, then, the onion could also have been thought of as symbolizing union with the Lord, which, no matter how many layers we penetrate, can always be deeper still. Unio also means a single pearl of large size. The pearl of great price, layer upon layer like the onion, is the acknowledgment of the Lord alone. We go into the Holy City New Jerusalem by entering in through the layers of mystery that make the gates of pearl. This theme of layers of covering is echoed in the Apocalypse Explained treatment of the holiness of the Word: "The spiritual and celestial things of the Word are comparatively like the holy things of the tabernacle ... which could not be called holy and a holy place until they were covered round about with curtains and veils" (AE 1088:2). Take away the coverings and you lose the holiness. Dispense with the layers and the mystery disappears, and with it the excitement and the interest. What we need to cultivate is the sense of wonder and mystery that will inspire a lifetime quest to peel back the layers. I have this problem. So often when I wish to address something distinctive about the New Church, I think of C. S. Lewis, who explicitly denies any influence from Swedenborg. Well, anyway, in his autobiography he speaks of experiencing as a child brief glimpses of something he calls "joy." As he grew in boyhood, however, these experiences vanished, at least until he chanced one day upon Rackham's illustrations of Siegfried and the Twilight of the Gods, and the sensation returned in a rush. From that moment forward his life was changed and he began the quest for what lay beyond and behind this feeling, ultimately resulting in his conversion to Christianity. The joy of which he speaks seems to be some kind of sense of the numinous. In The Power of Myth Bill Moyer asks Joseph Campbell, "How would you advise somebody to tap that spring of eternal life, that bliss that is right there?" Campbell responds: "We are having experiences all the time which may on occasion render some sense of this, a little intuition of where your bliss is. Grab it. No one can tell you what it is going to be. You have to learn to recognize your own depth." The fascination of ancient Egypt has persisted through the ages. What secrets were hidden in the pyramids? The riddle of the standing stones at Stonehenge and elsewhere has caught up the minds of others. Who was it who made the giants dance, and what was their purpose? The Alchemists searched for generations for the Philosopher's Stone, the key to the meaning of life, as well as of transmutations. All of these varied symbols stand, in a way, for the Ancient Word, the idea that there was a wisdom of old, a science of sciences that held the secret of life. The quest, of course, does not have to be after that which was lost. If we broaden our vision we can see that there is the same kind of inspired striving in mathematical creativity, artistic aspiration, or scientific discovery. The search is actually for a glimpse of the spiritual, which infuses life into the dead clay of this earth. It is just that the Ancients had a grasp of this that has not yet been surpassed. The number one priority in teaching correspondence is: Don't kill the mystery. Our sensual scientific age is always anxious to murder, to dissect. As it is said in Faust, "Who wants to know and describe the living things seeks first to drive out the spirit, then holds the parts in his hand, but alas, the spiritual bond is now lacking." Look at the illustrations in so many modern children's books, including most textbooks. The mystery is gone and with it the life. I have recently been reading to my children again The Garden Behind the Moon. Howard Pyle turns many a mysterious phrase therein. In response to a question about the meaning of the story, he replied: " ... .there is indeed an intended inner meaning to [the story], but to explain it would require a long dissertation, at the end of which that certain indefinable mystery with which I intended to surround the story would be altogether dissipated." Poetry explained is no longer poetry. There was great excitement at the beginning of the nineteenth century, when the Egyptian hieroglyphics were deciphered. But from the standpoint of the imaginative the translation was a great disappointment. Instead of yielding the mysteries of the ages, the texts were prosaic histories and legal documents. So it is that there are those of us who still believe that the hieroglyphics have scarcely even begun to yield their secrets. I foresee the study of language in general, and Hebrew and Hieroglyphics in specific, to be among the fruitful fields for the pursuit of the science of correspondences. When the Lord said, "Behold I am making all things new," He spoke in the eternal present. There can be nothing static about the New Church. My impression of the Church as I was growing up was of an establishment dedicated to the status quo, an establishment trying to convey a fixed and already complete body of knowledge. We must show the students in our charge that what is known is but a small drop in the vast ocean of what is yet to be known, that to learn is to take part in a process that is continually new. The newness of the New Church and its doctrines is a living, on-going process, not some event frozen in history. Let us teach correspondences not as a dead set of equivalences, but as an organic, living, exciting mystery. The doctrine of correspondences is generally thought of as a kind of "code" or "key" whereby the hidden meaning of the Sacred Scriptures may be opened. Thus the doctrine has to do with the meaning of words. But when we consider the actual meaning of words -- not this word or that word, but the nature of language itself -- then we see that this doctrine has much broader implications. Creation consists of two elements, the spiritual and the natural. These two come together in the human mind, which is sensible of both realms. We are able to see the presence of the spiritual in the natural, and how the natural relates to the spiritual. We are able to perceive the correspondence of the two worlds. Human language, I believe, is based upon this correspondence. 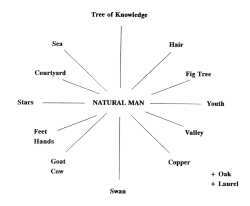 The essence of language is not just to give names to natural things, or serve as the means of communicating natural ideas, but is designed to give a natural form to abstract or spiritual things so they can be grasped by the natural mind. In creating the natural world, the Lord has already given natural forms to spiritual things, but when we consider the purpose of creation (a heaven from the human race), it would seem to follow that creation is not complete without that highest of created forms, the human mind, which is able to behold and understand and be affected by -- and in itself to order! -- what the Lord has created. The creation of the natural world, which is basic to the existence of human minds, also laid the foundation for human language. Language is not something invented by the mind of man, but is in fact a property inherent in mind itself. In creating the human mind, the Lord also created language, which may be seen as an extension of the very essence of what a "mind" is: namely, a vessel capable of responding to, and relating, the spiritual and natural planes of creation. Human beings are not just one more of the innumerable creatures that exist on this planet, but are the means by which the natural world is conjoined with the spiritual and with the Creator. It is in the immortal minds of men that spiritual things have a permanent natural foundation. Nor is human language simply a natural development; it is a Divine gift, the essential use of which is this conjunction. Language is the means of expression from one mind to another, but prior to that, it seems to me, it is the means whereby the spiritual degree obtains fixed, permanent, and perceptible form in any individual mind. This is why writing something down, or discussing it with someone, helps clarify our ideas. Putting things into words, even if just in our own minds and unexpressed, is essential to thought. spiritual in us. Abstract spiritual truths, to be grasped, must be abstracted from something, namely from the ultimate natural forms of this world. Language is the means whereby this process of abstraction is accomplished. The "science of correspondences" is the means for understanding all this. Like any science, it provides an order and method for examining and understanding, and thus better using, some aspect of creation; only in this case we are dealing with a very deep and all-encompassing view of creation. Because of its essential origin and use, language is creative. It is the means whereby something new is created -- not out of nothing, but by giving a natural form to spiritual substance, which is the prior soul of a thing. At the deepest level, this substance is Divine love formed by Divine Truth. As it says in the Gospel of John, creation begins with the Word. "In the beginning was the Word... All things were made by Him" (John 1:1, 3). The doctrine of correspondence, then, is not just a "key" which opens a particular kind of language (i.e., Scriptural), but is inherent in creation itself and thus in language itself. I was interested to note in the dictionary that the Greek and Latin root words for "parable" mean "to compare" and also "speech" generally. We can see this connection in the English word "palaver," meaning a kind of speech or communication; it is derived from Latin "parabola," meaning "parable" or "speech." All speech is parabolic; it has to be interpreted. The sounds themselves have to be interpreted, and the words must be interpreted as to their meaning or significance. The word "parable" itself comes from two Greek roots, "para" (beside, or alongside of) and "ballein" (to throw); the Latin root derived from these Greek words is "parabola." Interestingly, the dictionary refers you to "devil" for more information. The Latin "diabolus" (from Greek "diabolos") again comes from "ballein" (to throw), but here prefixed by "dia" (across). The meaning is to slander. The devil represents the obstruction or perversion of truth. While angels are messengers who bring truth to men, devils seek to intercept the truth by destroying the correspondence upon which it is based. Truth is not something we can see as it is in itself; we see it parabolically, or correspondentially. Correspondence or parabolic language, therefore, involves casting one thing beside another and seeing them in relation to each other, while to cast an obstruction that blocks this perception is the work of the devil. We would note here the two meanings of "correspond": first "to suit, agree, fit, or match," and second, "to have communication." The truth communicated by angels is for the sake of bringing human beings into agreement with that order in which the natural world was created -- namely, correspondence with heaven. New Church education is dedicated not just to transmitting knowledges or facts, but to opening the minds of the students to see the Truth. The doctrine of correspondences is therefore essential to this use. It applies, first of all, to the Sacred Scriptures, which must be understood correspondentially. But in all fields, the doctrine of correspondence is vital to gaining a perception of the spiritual reality which constitutes the substance and soul of all natural things, including material objects and the affairs of men. Truth is living. The doctrine of correspondence, therefore, is not just for an intellectual exercise, or a word game, but a matter of life. As the Lord said, the words He spoke are words of life. And the devil does not just block understanding, but destroys life. The relationship expressed by the term "correspondence" is an organic, living relationship. The very word means "to respond together." It thus has the idea of a living mutual response; a functional relationship, not something inert. Our bodies and souls correspond when they respond together, in harmony, to the life flowing in from the Lord. In conclusion, then, I think that in order to appreciate the power of correspondences, we need to consider the power of language. If we think of words as dead, arbitrary, humanly formed symbols, then the doctrine of correspondences will seem a lifeless and unimportant matter. But when we consider the Divine source of human language, its relationship to creation itself, and realize the power contained in words, and especially in the Word, then we see that the doctrine of correspondence has tremendous potential. The ancients in their fall abused this science to perform magic. Will the New Church in its ascent rediscover the power of correspondences and use it for good? "Miracles have not been done from causes sought out from nature ... Miracles related in the Word were done by means of influx from that prior world into this posterior one, ... by means of bringing such things as are in the spiritual world, into corresponding things in the natural world, so that the things which come forth actually in the spiritual world are actually brought into such things in the natural world as correspond." Miracles actually happened in response to spiritual necessities, or the guidance of Providence. It was an era in which the spiritual world was actually present in the natural, through miracles. Thus," ... representations of Divine omnipotence had force, as had all representations at that time, when commanded." (AC 7673.2) this refers to Joshua conquering Ai, just by pointing his spear at it. The Lord came on earth, and apart from miracles, the Christian Church could not have been established. He was the Creator come into His Creation, and effected miracles which blasted a path for the parables and teachings to take root. These are the miracles that can happen in the classroom. Originally miracles happened because there was no other way for the spiritual to be revealed, than in such a way that people on earth who witnessed them, could by their means be instructed in the truths necessary for their salvation. But now, after the time of open miracles has passed, the lines of force are still there for the mental equivalent of ALL miracles to happen on a continual basis. Samson's strength was entirely in the correspondence of his hair, not because he 'pumped iron'! The same could happen today, if the Lord chose to flow in the same way as happened "at that time" in the past. Now, the Lord on earth was the fulfillment of the prophecy of Samson's life. Samson's strength on earth became the Lord's power and authority: "They heard Him gladly, for He spoke with authority." The Literal Sense of the Word, represented by Samson and his hair, the Lord quoted liberally while on earth, demonstrating the same strength in "slaying the Philistines," or faith alone as Samson had. So when we read the quote so often referred to by President Childs of "man's sight being led forth abroad," and "such was the Lord's sight" (AC 1806, 1807), we can suppose that "such was the Lord's strength" as well. I am suggesting the same thing can happen in the classroom: There can be as powerful a combination of doctrine and classroom material as in miracles. And this is where Joseph comes in. Joseph was also a Nazarite, like Samson. We read: "The blessings of your father ...hall be on the head of Joseph, and on the crown of the head of the Nazarite of his brethren." (AC 6437, from Genesis 49.26) This word "Nazarite" is found neither in the KJV nor in the NKJV, but is there in the Hebrew. I contend that this provides us with a METHODOLOGY, long sought after, of applying doctrine to scientific fields, or to classroom curricula. was impressed by the cohesiveness of the vision, as put forth by many from Benade up to some members present in this room. I have incorporated what has been said, into five steps of applying doctrine to curricula, incorporating also insertion, extraction, and sublimation, as specified above. 1. ]oy of teaching: At times through the year, the Teacher should pray to the Lord for guidance in teaching the course in the light of His Word. 2. Sense of Values: Discover which doctrines apply to your subject field. 3. Reorientation, Frameivork: Practice dealing with the subject field, while thinking of the doctrine. 4. Insertion, Verification: Practice stating your material in new wording, not tried before. Reorient material to receive the doctrine, or verify it, or neutralize material which does not receive, or which rejects doctrine. 5. Discernible Goals: Plan insertion (lectures, presentations, texts, etc.) extraction (research, papers, returns) and sublimination (conclusions, evaluation, mastery of subject) in your course, or recognize them as they may already exist. I believe these five steps represent what teachers have done, or tried to do, or what can be tried in new ways. I believe they give us a chance to give the subject material for each course a "miracle-treatment," so that it will be distinctively New Church both in content and manner of presentation, - and perhaps in effect! The following is a quick effort to flesh out the remarks that I made during the Correspondence Seminar last summer (1991). This is not intended to be a study, just thoughts. I have not included specific references to the Writings in the interest of time in getting this onto paper. In the beginning was the Word, and the Word was with God and the Word was God (John 1:1). These words from the gospel of John have great significance in regard to the doctrine of the Word in general and the idea of correspondences in particular. What John 1:1 says to me is that the Word is linguistically a foolproof method of communication from the Lord. The Writings have much to say about the miraculous communication from the Lord that is possible by means of the Word. The correspondential style of the Word is said to be the mechanism by means of which this communication is possible. Is there perhaps some relationship between this style of communication and the theories of Noam Chomsky and other linguistic scholars who have come to be called transformational grammarians? These scholars have pointed out that human beings use language as a means of creating a psychological model of the so-called "real" world within their own heads. We represent the world outside of us within ourselves, and in so doing create a map of reality which only approximates reality itself. They point out that in making this inner psychological map of reality human beings use three major processes - generalization, deletion, and distortion. Generalization is the process by which a specific experience comes to represent the entire category of which it is a member. For example, a dog bites a child, and through generalization all dogs become dangerous to the child, perhaps creating a life-long fear. Deletion is the process by which selected portions of the world are excluded from the inner representation. For instance, a man's mother-in-law becomes like an enemy to him because he creates an inner map of her character based on certain of her intrusive words or actions, while he deletes other words and actions which express caring and concern. Or, a student fails an important test and begins to believe that she is unable to learn, deleting all of the tests she has passed with high grades. Distortion is the process by which the relationships formed among parts of the model are represented differently from the relationships which they are supposed to represent. A common example of distortion is the representation of a process by an event. A theological example of such distortion is the belief that salvation is the result of an event in time, rather than a process through time. On a more personal level, a common distortion people often fall into is turning the decision-making process into an event rather than an ongoing process. The result can be a great fear of decision making. language used is the Lord. And this holds true for the nature of the Word regardless of the language within which it may be translated. I would posit that this is true because of what transformational grammarians call the "deep structure" of the language of the written Word. I would further suggest that the deep structure of the Word is linguistically flawless, in both substance and form. The inner message is supremely clear and the deep structure which carries that message is the Divinely-ordered cosmic symbolism of the universe. Furthermore, I suspect that this cosmic symbolism, or correspondence, is in fact the very root of the deep structure of all human language, and is what causes language to be comprehensible. The Divinely-ordered images from the three kingdoms of nature, animal, vegetable, and mineral, are perfectly suited to human comprehension: when Divinely ordered they serve as a perfect re-presentation of the Lord to the human mind. This seems to fit with the teaching that a sincere person who reads or hears the Word in its literal sense, actually understands the internal sense within his internal man even if his external man is unaware of this knowledge! The Word is indeed a marvelous creation, a continuing extension of His Divine Humanity into our conscious and unconscious awareness. "And the light shines in the darkness, and the darkness did not comprehend it." 1) Teaching doctrine from correspondence: In this category I would place all of the wonderful and sometimes mysterious quirks of science and mathematics which are to my mind correspondential illustrations and confirmations of doctrine. Efforts such as David Simons' Unity in the Universe would seem to come under this category. With the advance of science in the twentieth century, more advanced concepts of science such as quantum mechanics, relativity theory, and molecular biology offer many illustrations and confirmations of doctrine. 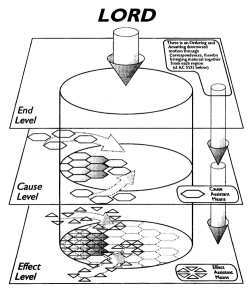 Quantum mechanics offers a number of what I consider to be highly correspondential examples of doctrine. One such example from quantum mechanics deserves a great deal of thought from New Church teachers. It is now a well-established scientific fact that matter and consciousness are in some way mysteriously interwoven (suggested by Heisenberg's uncertainty principle and the observation that the states of matter are affected by observation). It seems to me that an ongoing effort to find these illustrations, explaining them in layman's terms with suggestions for appropriate grade levels, might be a useful resource for New Church teachers. dences of the Word should be studied in context to show how meanings change according to context and may even take on opposite meanings. The correspondential meaning of human actions, particularly in regard to courtship and sexuality should be considered. 3) Using correspondences: Since all human activity involves correspondence, obviously we use correspondence in education all of the time. But what I am suggesting here is a more conscious and deliberate attempt to use the power of correspondence in reaching young minds with the beauty of the Lord's truth. For example, story telling which consciously employs correspondential symbolism to teach life lessons, or point out moral issues, or even simply to entertain seems an appropriate avenue for teachers to pursue. This was the delight of delights in the Ancient Church, and we are informed that the Ancient Church and the New Church are similar in internals. Perhaps we could do much more with story telling and story writing in teaching correspondence. I have found the students love to talk about their dreams. As we know, dreams are often subtle correspondential messages from our good associate spirits, pointing out areas of our life that need attention, and even suggesting solutions to everyday problems. More of a focus on dream interpretation and even dream work with students would appear to me to be a valid avenue for future New Church educators to pursue. Guided meditations often use correspondences to help us see our life from a new perspective. I believe we could develop unique New Church meditations to augment certain aspects of the teaching of religion that could be very powerful for students. The process evokes an internal response that I believe is similar to what happens in dreams, inviting subtle clues from our good associate spirits from which we may gain important information about ourselves. The correspondences of the body are very much a part of human communication. In fact some studies indicate that 80% of human communication is non-verbal, that is, through such subtle cues as tone of voice, body position, muscle tone, skin color, eye movement and the like. As the Writings make very clear, all of these are correspondences. Greater focus on the correspondence of body language and human communication could well improve the effectiveness of New Church teachers, while some direct attention to these matters in course work might go a long way to improving marriages and family life in the church. 4) Diagnosing the situation: As we know from the Writings, the inner quality of an individual, a group of individuals, or an organization, tends to make itself manifest through correspondence if we have eyes to see it. The Writings mention that when the Catholic church removed the Word from the laity, at some time later they also removed the wine from the Holy Supper for the laity. Such correspondential images of our inner qualities have a way of making themselves manifest, and I believe we are invited to use this correspondential information, however tentatively, as a source for legitimate inquiry and discussion. For example, one could engage a class in a discussion of what the behavior of the class might mean to an outsider knowledgeable in correspondence who was simply observing at a distance. Why do teachers need to understand the place, purpose and power of correspondence in education? Essentially, because correspondence is the primary tool used by the Lord in His teaching. It is the way He accommodated His leading and His instruction for reception. It is the way He approaches mankind in His Word and in His creation. We define correspondence as the living relationship between internal and external things, between the mind and the body, between the spiritual sense of the Word and the letter, between content as affections and thoughts as words; and between spiritual things and natural things. The Lord led and taught in two ways, both of which involve correspondence. He taught by miracles and by parables. He led by miraculous things primarily for the will and taught by parables for the understanding. "And Jesus healed all that were sick" (Matt. 8:16). "All these things Jesus spoke in parables; and without a parable He did not speak to them" (Matt. 13:34). It seems to me that a study of correspondence needs to start with analyzing how the Lord used correspondence in miracles and in parables to accommodate His life for reception. If we begin here, the more complex teachings of the Writings will fall more readily into place. Correspondence is the way the Lord led and taught from externals to internals, from natural things to spiritual things, from earth to heaven. Correspondence is the glue -- the bonding material -- which holds interior and exterior together to unify things that are discretely different. End, cause and effect are discretely different in vertical order, but make a one in horizontal or simultaneous order: i.e., what we love, what we think, and what we do are all different, yet are unified in simultaneous order of actions, and that which unifies them is correspondence. Our deeds correspond to the thoughts and loves from which they come. In miracles what the Lord did for men's bodies demonstrated correspondentially what He wills to do for their minds and spirits. When the Lord told a parable about things on earth He was talking correspondentially about things in heaven. Why did the Lord use them? Miracles caused surprise and wonder; they caught people's attention. The Lord did external miracles -- changed water to wine, walked on water, and raised men from death -- so He could lead men to the internal miracles of reformation and regeneration. His external miracles corresponded to the internal miracles He willed to do for men -- to turn natural truth into spiritual, to show His Wisdom and Order operating in all nature and to demonstrate the purpose of His coming: to raise man from spiritual death. received, miracles no longer occur" (SD minor 4724). Miracles are for the will in that they catch people's attention, cause them to sit up and take notice. "They were astonished beyond measure" (Mark 10:26). Thunderstruck! The Word and creation are both living miracles which derive their power from correspondence. The Word as a miracle contains internal life and light correspondentially. "The words that I speak to you are spirit and they are life" (John 6:63). "The Word is living and gives life because in it, in the supreme sense, the Lord is treated of, and in the inmost sense, His kingdom ... so that it is life itself that is in the Word, and that inflows into the minds of those who read the Word with reverence" (AC 3424). This life is held in the Word correspondentially. A key to the internal sense of the Word is the knowledge of correspondence revealed in the Writings. In all creation we see miracles, but because we see them repeated over and over again, we don't think of them as miraculous. "All things which are viewed in nature ... take place from the influx of the spiritual world into the natural; and in themselves are marvels; which on account of their accustomed aspect and perennial recurrence, are not accounted as miracles" (De Miraculis 60). Teachers need to discover miracles for use in the classroom, things which cause wonder, surprise, and respect. "What will we be doing today?" "You'll be surprised!" "I wonder what comes next?" "You'll hardly believe it!" The unexpected, a surprise, catches children's attention, opens their eyes in wonder, and prepares them to learn. In my science class I boiled the water out of a five gallon can, put a lid on it, placed it on a shelf in the front of the room, and then went on with the class. As it gradually cooled, miracles began to happen in front of our eyes -- it crumbled and crackled, pressed in by atmospheric pressure. You can be sure the children never forgot that lesson. Teachers need to restore the sense of mystery, wonder, and magic to the commonplace happenings in nature. Nature is awe-inspiring in itself and this needs to be brought out and dramatized. The very rocks -- minerals of the earth -- perpetually cry out to proclaim the Lord their King to those who "have ears to hear" (Luke 19). Let the facts speak for themselves; theirs is a correspondential message. External miracles in the Word and in the world are the way the Lord accommodates or steps down His omnipotence for reception. Correspondence is the mechanism which makes this possible. Miracles are the Lord doing on earth what He does all the time by means of correspondences in heaven. The Word is itself a miracle and has holiness and power from the internal things it holds within. The Word is accommodated to the simplest and most external states of reception. It feeds and delights the natural mind, as John the Baptist was fed locusts and wild honey. "Locusts" correspond to general truths contained in the letter and "wild honey" to the delights felt in the letter. and effectiveness present. From a knowledge of correspondence and accommodation we can understand something of how this power is derived and work to use it more fully. The Lord led and taught by miracles and parables. By miracles He accommodated His omnipotence; by parables His omniscience. Accommodation is the teachers art; it is using the Lord's way to make Him visible to our students. Correspondence is the means to make this accommodation work. "Divine Truth is not received by anyone unless it has been accommodated to his apprehension, consequently unless it appears in a natural form and shape; for at first human minds apprehend none but earthly and worldly things and not at all spiritual and heavenly things. Wherefore if spiritual and heavenly things were set forth openly, they would be rejected as if they were nothing..." (AC 8783). By accommodation in parables the Lord provides for our "as-of-self" freedom which is a vital ingredient in education. Parables are the Lord challenging us to use our minds to discover internal things in His Word and in His created world. Parables, by their inner meaning, invite the free response of all those who hear. By correspondence higher things are represented in lower, things of heaven in worldly things. Our minds are elevated when we freely work to understand parables by making a "rational leap" from externals to internals. It is rational in that correspondence is a consistent cause-and-effect connection, and to work to penetrate a parable is a rational process. Correspondence is the connecting link between cause and effect -- between discrete degrees. When we work to transpose natural things to spiritual, the miracle of changing water to wine can take place in our minds. Learning to see the Word and the world as a parable is what New Church education is all about. Thinking from correspondence -- parallel thought (parable) -- is seeing internals from externals, about which the Arcana teaches: "The eye itself is nothing else than the sight of the spirit itself 'led forth abroad,' the specific purpose of this being that from external things a person may see internal things that exist in the next life, for it is for the sake of (this internal) life that he lives in the world. Such was the sight of the Most Ancient Church, such is the sight of angels who reside with man, and such was the Lord's sight" (AC 1806). "People whose concern is for Divine ideas never dwell on the objects of external sight, but from and in those objects they are continually seeing internal things ... To such persons the literal sense (the parables of the Word) exist solely as the means which enable them to think about (or see) spiritual things" (AC 1807:4). Such internal sight can be open to those who understand correspondence. Now that we have distilled some of our best understanding of the concept of Correspondences as used in the Writings, it might be useful to place our study in something of a historical framework, with its relation to the hermetic tradition, archetypes and mythopoeic thinking. The study of the Science of Correspondences can be said to be part of what is known as the Hermetic Tradition, a stream of occult studies and beliefs having their source at the beginning of recorded history in ancient Egypt. Belonging to the tradition are a myriad of cults, practices and idealist philosophies such as astrology, mythology, magic, Platonism, Gnosticism, caba-lism, Freemasonry, alchemy, and even homeopathy and transcendentalism. The term often implies secrecy or exclusiveness, but more pertinent to our interests, the inclusion of the Science of Correspondences in the Tradition, is the primary assumption of the Tradition that there is a realm of the spirit, a spiritual as well as a natural reality. The Tradition gets its name from the Egyptian god Thoth whom the Greeks equated with their Hermes, adding the appellation "Thrice Great", or Hermes Trismagistos. Because of Thoth's depiction in the Egyptian Judgment scenes as the Ibis headed Scribe recording the destiny of the weighing-in of the spirit's heart against the feather of truth, and because of the tradition that Thoth invented the earliest writing, the Hieroglyphics, the Rev. C. Th. Odhner concluded that Thoth represented the ancients' concept of the Ancient Word. One can easily agree with this interpretation when one examines the attributes of the Greek Hermes and his Roman equivalent, Mercury, with the birds' wings on caps and sandals and on the serpentine caduceus: the messenger between gods/God and man, certainly the Word. If we accept Odhner's concept of meaning and use his methodology we can unlock rapidly a long chain of symbols stretching from ancient to modern times. We can trace the concept of Thoth through Hermes/Mercury to Caesar's statement that Norse Odin "is our Mercury"; Odin with wings on his cap, birds on his shoulders, "thought and memory", who circle the world daily to gather truths; Odin who surrendered his eye to the well for wisdom, who invented the original sacred language, the Runes. Note that the bird symbol was carried into the Middle Ages to represent the Holy Spirit, God with us, the communication of God with man! It is not remarkable that the bird or feather symbol would be used through the ages to represent the communication between heaven and earth. But more interesting is the fact that men gave the very name of that bird-god who embodies its meaning to the Tradition itself. For Thoth, Hermes Trimagistos appears to represent the ancient embodiment of the concept of correspondences, the Ancient Word. In one sense we may say that the Science of Correspondences is not so much in the Hermetic Tradition, but that it is the Hermetic Tradition, because it is the means of communication between the spiritual and natural world. early Christian Church Fathers, to modern times. Suppressed periodically by the pragmatic Church, it occasionally burst forth, such as in the flood of mystical Grail legends with their eastern and Celtic roots which surfaced in the 12th Century. It was especially in the pre-Renaissance world of Paracelsus and Aquinas when the Hermetic tradition really took hold again as a vigorous current sweeping along with it the occult studies of Astrology and Alchemy. The republication of the Corpus Hermeticum and its subsequent sixteen editions, and the work of Giordino Bruno contributed to the revival of NeoPlatonism in the Age of Enlightenment where the Newtons and the Keplers, more Astrologers than Astronomers, and of course Swedenborg, became absorbed in these ancient "sciences". The Romantic and Transcendental philosophers and PreRaphaelite artists perpetuated the idea of the upper or inner level of reality through the 19th Century, where the old religions had failed. They must have been powerfully, if indirectly, reinforced and reinvigorated by the New Revelation. The Jungian Psychologists, Symbolists, Mythologists, and Linguistic Structuralists appear to be serving that end today, keeping alive the rational idea of the reality of the spirit and the importance of meaning, until the truths of the New Church can spread openly. Beyond all other concepts, C. G. Jung's description of the operation of the archetype, as he defines it, is most helpful to me in understanding something of the nature of correspondences and how they operate through the human mind. Jung's archetype is not to be confused with the ancient and medieval use of the term archetype. That was used as synonymous with "prototype" or an original model in the ideal world, after which other things are patterned; a paradigm. But since the Jungian development it has taken on a new meaning which I believe comes closer to a living idea of the operation of correspondences. The ancient philosophers who first coined the word archetype, were probably still thinking in terms of remnant truth from the Ancient Church, i.e., they were thinking from the conviction that there was a spiritual as well as a natural plane of reality. The archetype or prototype was probably thought of as existing in the upper or spiritual level, and as causal, rather than merely before, as it was later used. in all these similes, yet to the perpetual vexation of the intellect -- remains unknown and not to be fitted into a formula." p. 76. Essays on a Science of Mythology. Jung on Synchronicity and Correspondences. In discussing his theory of synchronicity, Jung dismisses what he refers to as the old theory of correspondences, probably because it assumes causality in its presumed parallel relationship of the natural and spiritual and cannot be demonstrated. "No reciprocal causal connection can be shown to obtain between parallel events, which is just what gives them their chance character. The only recognizable and demonstrable link between them is a common meaning or equivalence. The old theory of correspondences was based on the experience of such connections -- a theory that reached its culminating point and also its provisional end in Leibnitz' idea of pre-established harmony, and was then replaced by causality. Synchronicity is a modern differentiation of the obsolete concept of correspondence, sympathy, and harmony. It is based not on philosophical assumptions but on empirical experience and experimentation." p. 115, Jung's Synchronicity. The common link in the age old "tradition" of Correspondences, then, is spirit or meaning. What is the meaning of "meaning?" The Mythologists, Structuralists and Semanticists have a lot to say about meaning. Casssirer speaks of transposing the Kantian principle that all knowledge involves, at the instant of its reception, a synthesizing activity of the mind -- into the key of myth. Wheelwright says "Myth here becomes a synonym of the mythopoeic mode of consciousness." has a value in itself -- a value independent of its embodiment in any literary work" -- and again, "if some perfected art of mime or silent film or serial pictures could make it clear with no words at all, it would still affect us in the same way." p. 41, C. S. Lewis, An Experiment in Criticism. Levi Strauss also says "What gives the myth an operative value is that the specific pattern described is everlasting, it explains the present and the past as well as the future." The Law of Correspondences. The universal applicability and representation of myth and meaning is expressed so simply and yet profoundly in the haunting legendary engraving on Arthur's tomb "hie iacet arturus, rex quondam rexque futurus." Arthur, a prime example of the "typical" Hero, was and is and is to be. The typical hero is historical as well as mythological and universal. (See Lord Raglan's book, The Hero and Cirlot's Dictionary of Symbols, p. xiv) In connection with this question of the relationship between the historical and the symbolic, Rene Guenon has observed: "There is indeed over-eager acceptance of the belief that to allow a symbolic meaning must imply the rejection of the literal or historical meaning; such a view shows an ignorance of the law of correspondences. This law is the foundation of all symbolism and by virtue of it everything proceeding essentially from a metaphysical principle, which is the source of its realism, translates and expresses this principle in its own way and according to its own level of existence, so that all things are related and joined together in total, universal harmony which is, in its many guises, a reflection, as it were, of its own fundamental unity. One result of this is the range of meaning contained in every symbol: any one thing may, indeed, be regarded as an illustration not only of metaphysical principles but also of higher levels of reality." Begrunden. There is an interesting concept discussed in Kerenyi's Prolegomena in Essays on a Science of Mythology. He uses a German word because he feels there is no English equivalent. "Begrunden" means, literally, "grounding", "establishing," "founding" and at the same time abstract "reason." Is this equivalent to the Writings' "ultimating?" -- as we do when we act out and reinforce our beliefs and feelings in ceremonies, in art, in our institutions and in our "body English;" when we act symbolically without becoming conscious of it and yet are confirming in deed what we feel but do not necessarily understand. Consider Begrunden in our body English, how we get a clue about our values by what we do in our art, in our customs of dress and in the very form of our organizations. The vertical, hierarchical organization chart makes a statement opposite to the "round table" of Arthur, Jefferson and the round table solution of the dispute about the seating at the peace conference at the end of the Korean War. The round table was a statement, in each case, about their beliefs in the consultative, the collegial, mutual respect, and the non-hierarchical. Eating Together. Consider the Rites and rituals of praying, and the Holy Supper; the traditions of Friday Supper, eating together, sharing the good of our food. Animals share their food with their young, but only humans share their food with other adults. Studies show that the only thing national Merit Scholars have in common is that they ate dinner with their parents and families! children of when we abandon our sense of correspondences? Perhaps the careful social planning of Friday Supper is as important as a carefully prepared Doctrinal Class, the one would ultimate good and the other ultimates truth. Both should be guided by Doctrine. We need the conscious reinforcing or "grounding" of our good and best affections and traditions from within, as well as the passing on of truths from without. Clustering. Philip Wheelwright suggests that with the mythopoeic mode of consciousness there is a strong tendency of the different experiential elements to blend and fuse in a non-logical way. He also uses the term coined by Max Muller, "diaphoric," "the expression of a complex idea not by analysis, not by direct statement, but by the sudden perception of an objective relation." He assumes that the most forceful archetypes are likely to arise out of a diaphoric situation where at least two of the diaphorically related elements represent human functions or interests of a deep-going and pertinently associated sort. (The Semantic Approach to Myth). Other Mythologists refer to this as "clustering." 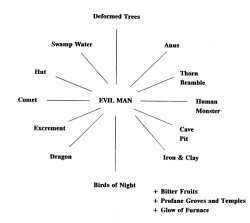 (There are many examples of various combinations of sword and stone, serpent and foot. See the Stith-Thompson Motif Index. Consider the "Vulnerable Spot" and the "Forbidden Fruit" motifs in myths and legends. I dare say most of these can be seen in the first eleven chapters of Genesis and could be traced back to that original Treasure House of Correspondences, the Ancient Word. Perception of Meaning. At this end of the long stream of the Hermetic Tradition, Psychologists and Linguists have thrown light on the mental processes by means of which we recognize and affirm truth. Jung has described the activity of the Archetype in the Collective Unconscious as organizing external data into meaningful patterns. 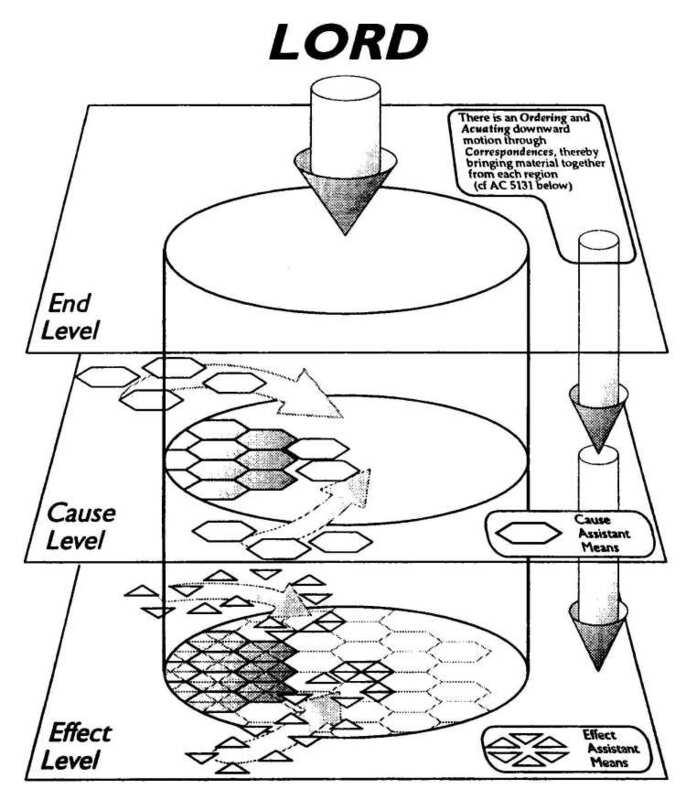 Gestalt provides a theory involving closure where there is a clustering of related factors and meaning is perceived. Rank, Raglan and Campbell develop the organizing theme of the Hero myth. Countless mythologists and psychologists show how significant symbols seem to "ground" universally recognized truths into meaningful life experiences. In the revealed doctrine of the Science of Correspondences we have at our disposal the long searched for key which can unlock, open up and throw full sunlight into the mental treasure house which lies at this end of the torch-lit river barge procession. Fresh air from the Second Coming has caused some torches to flair up and inspire secular scholars and our own young people to take renewed interest in occult studies, perhaps because it revives the heretofore dormant human hope of the reality of the spirit. We must meet the candle-lit processions and relay their torches with rationally developed presentations of that Science as we understand it. We need to share with them, speak their language and learn from them what they understand about the processes of thinking and mythologizing. We need to enlarge our own awareness of the importance of correspondences in the internal process leading to the perception of truth. We need to understand better how the Lord operates on the soul and mind which are immediate correspondential representations of His Image, as the Organizer of data and the Spirit of Meaning, the One who is Meaning Itself. "He causes truth to shine" (TCR 349). The doctrine of "correspondence" reveals the relationship between spiritual and natural things. It is an organic, living relationship, in which the spiritual flows into the natural and forms it to serve a use. The relationship is not just one of analogy, but of cause and effect. In the natural world, spiritual forces (causes) proceeding from the Divine "terminate" or come to rest in corresponding effects. This doctrine, therefore, makes spiritual things real and concrete, so that we can see and understand them, and it also reveals the deeper spiritual significance of all natural things, and as well of the Word of God, which is written in correspondences. This body of teaching is thus very important in New Church education. Correspondence is a term that literally means 'the condition' (-ence) of reacting (respond) to one another (co-). Therefore, for there to be correspondence, there must be at least two things. Definition: Correspondence is the condition in which what is higher (or interior) flows into what is lower (or exterior) causing it to live [for all life is from the Lord and it flows down or out], while the lower (or exterior) acts as a foundation (or container) for what is higher (or interior), allowing it to live. An example is the spirit and the body which indeed correspond. 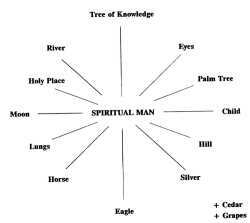 The spirit flows into the body causing it to live, while the body acts as a foundation allowing the spirit to live. They need each other for life. Closely associated with correspondence, and too often confused with it, are signification and representation. I believe that a better understanding of the definition of correspondence comes from a proper contrast among these three terms. Correspondence is the master term, and the others draw their meaning from it. characteristics, and its functions. The hardness and so the endurance of a rock corresponds to the solid nature and the eternity of truth. [I rely on Platonic thought here, and say that what corresponds are 'rockness' and truth.] The rock itself as an object represents truth. And the term 'rock' and every picture of a rock then signify truth. Further with regard to David, we know that he himself did not correspond to the Lord, but rather represented Him. This is so because David was evil, and so his qualities prevented a correspondence. However, his function or his office of kingship did correspond to the Lord as to His Divine truth ruling. On the other hand, David as a person did represent the Lord as to His Divine truth ruling, and the term 'David' still signifies the Lord in the same way. 1. Correspondences "come down," rather than "rise up." The lower is derived from the higher, not the other way around. E.g., The natural, or literal, sense of the Word is formed from the spiritual, or internal, sense, not the spiritual from the natural. When we explain the natural sense according to correspondences, we are simply unfolding what was already in the living spiritual sense and is constantly there. 2. Correspondence, influx, and discrete degrees are virtually synonymous terms. There can be no influx without corresponding levels, and these levels, or degrees, are discrete. Again: Whenever discrete degrees are in correspondence, there is at once influx. "Influx is effected by correspondences" (DLW 219). E.g., Thought and speech correspond (if the person is sincere); thought and speech are on discrete levels; and thought flows into speech, not speech into thought. 3. It follows that true correspondences are dynamic, not static -- not like a graph. There is at once influx, from one discrete degree into another, when these degrees are in correspondence. This law keeps the natural world alive from the spiritual. E.g., When the external mind (which speaks and acts) is brought into order by repentance and self-compulsion, then it comes into a state of correspondence with the internal mind (where conscience is); and since there is now correspondence, therefore conscience flows into the external mind and fills it with its essence, so that the external as to quality is like the internal. "Blessed is the man who is in correspondence, that is, whose external man corresponds to his internal man" (AC 2994). 4. There is synonymity between the three terms when there is a state of order, not when there is disorder. When there is disorder, there can be representation, but not correspondence. E.g., If an insincere person speaks, then what he says may represent good affections and true concepts, but there is no correspondence with his actual affections and thoughts. Nor is there a straight influx, for the actual affections and thoughts wish to remain in hiding and therefore appoint substitutes to act for them. "These people draw near to Me with their mouth, and honor Me with their lips; but their heart is far from Me" (Matt. 15:8, Is. 29:13). To enable end, cause and effect to follow one another and act as one, the effect must correspond to the cause, and the cause must correspond to the end. Nevertheless the end does not manifest itself as the cause, nor does the cause manifest itself as the effect. Rather to enable the cause to exist the end must act on the level where the cause belongs, calling on assistant means to help it -the end- to bring the cause into existence; and to enable the effect to exist the cause likewise must act on the level where the effect belongs, by calling on assistant means to help it -the cause- to bring the effect into existence. These assistant means are the ones that correspond; and because they correspond, the end can exist within the cause and bring the cause into operation, and the cause can exist within the effect and bring the effect into operation. This list of Universal Principles as expressed in selected doctrinal quotations was the outcome of Session II of the Summer Seminar, chaired by Stephen Cole. In the search for principles/laws/guidelines to use in integrating correspondences into the curriculum, this list was put together to indicate what should be included in a structural study of correspondences throughout the levels of New Church education. The work of translating the quotations into such a structure awaits further consideration -- a challenge for the next round! AC 9555: "Everything in nature has relation to the human form and has its signification therefrom." AC 1894: "The Lord is the Only Man, and those only are men who receive the Divine from Him." HH 101: "Unless the Divine Human flowed into all things of heaven, and, according to correspondences, into all things of the world, no angel or man would exist." CL 84: "Good and Truth are the universals of creation and thence are in all created things." AC 4219: "Heaven is called the Grand Man because it corresponds to the Lord's Divine Human." AC 5377:2: "Not only all the individual parts of the human being correspond to the Grand Man, but also every single thing in the universe." DP 9: "In the universe, and in each and all things in it as created by the Lord, there has been the marriage of good and truth." CL 65: "Conjugial Love is the fundamental of all loves because its origin is from the marriage of good and truth, and from this marriage proceed all the loves that make heaven and the church with man." TCR 687e: "The whole world from what is first to what is last in it is full of representations and types of regeneration." DLW 184: "The knowledge of degrees is like a key for opening the cause of things." DLW 154: "In every created thing there are end, cause, and effect." TCR 75: There are two worlds between which there is a correspondence. TCR 351: "In all nature there is nothing that is not formed into series of little bundles. ... The universal cause is, that such is the confirmation of Divine truths; for we read that all things were created by the Word." Div. Wis. II 4: "It is a universal law of correspondence that the spiritual fits itself to use." DLW 88e: "Influx is effected by correspondence." TCR 814: "Influx is according to efflux." DLW 340: "There is a continual influx from the spiritual world into the natural world." DLW 409: "In all forms of uses there is some image of the Infinite and Eternal." DLW 46e: "Forms are containants of uses." CL 186: "Nothing exists except in a form, and state induces that form." AC 9836:3: "In ultimates there is power...Successive things at last form in ultimates what is simultaneous, in which these successive things are in a like order side by side." AC 1807:2: 'There is nothing beautiful and delightful in the heavens or on the earth, which is not in some way representative of the Lord's kingdom." TCR 75: "There is an order to the creation of everything in each world." TCR 622e: "Homogeneous affection conjoins while heterogeneous affection separates." DP 24: "In every matter, from the greatest to the least of it there must be variety; and when there is variety also in its opposite from its least to its greatest, and there is equilibrium between them, then there is a relation according to degrees on both sides." 1. To provide students with a greater ability to confirm the heavenly doctrines in the Scriptures. 2. To provide students with an ability to understand, be familiar with, and apply the relationship of uses between spiritual and natural things - and to enjoy this delightful adventure. 3. To bring back the honored and legitimate place of mythology and symbolism through the achievement of goals one and two. 1. To provide students with an intimate and working knowledge of key correspondential forms used in the Word. 2. To integrate the key correspondential forms and their uses into all areas of curriculum, beginning with the religion curriculum, but especially including science, literature, mythology and history. Garments, Weapons (Sword, Shield, Chariot), Musical Instruments, Numbers? 8. Trees, Vines, Flowers, Grains, Herbs, etc. The following examples of Correspondential Wheels is a first effort to use correspondences and representations to describe a spiritual form. All the forms in each circle have been chosen from the Word as describing some special aspect of a spiritual love or form. This does not appear as so from looking at the forms themselves in nature. 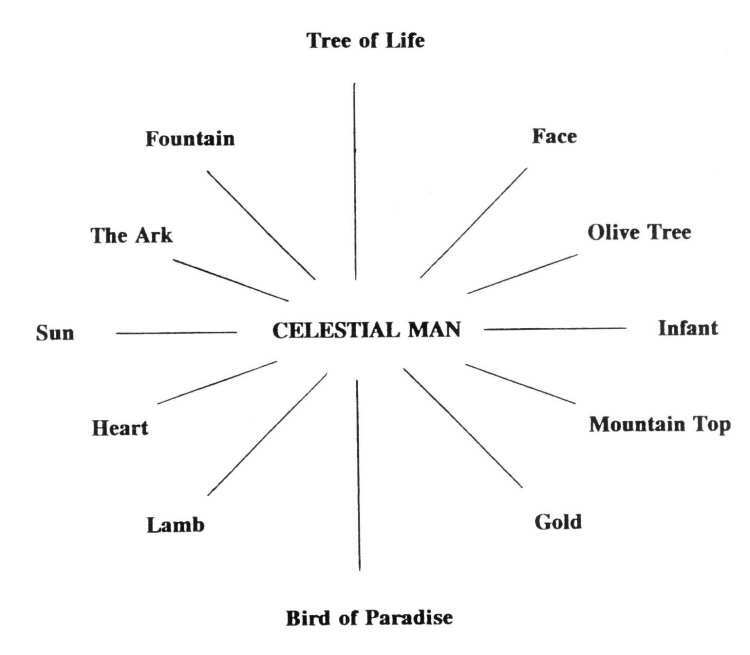 The laws of correspondences, however, when describing the celestial man, for example, show an intimate relationship between a lamb, a mountain top, the human heart, the sun, etc. These natural forms are pictorial and can easily be studied and imagined by the mind at almost any age from childhood through old age. force that sends life and nourishment to all lesser loves and affections. The sun portrays the internal warmth, the light, the creativity and beauty of this love. And so on with each related form. Each adds a spectrum of use and definition to the whole, that when brought together surely gives the mind a means to describe and envision the spiritual form. If we put the wheels one under the other in a descending series, we will find that the varied parts of each single wheel also find their counterpart in another wheel. The sun, moon, stars, and comets then form an obvious relationship to each other. Or another example would be the olive tree, the palm tree, the fig and the bramble. Always there is a descent from the highest to the lowest, and because the relationship is correspondential, the natural forms themselves have an internal relationship. More natural forms could be added to the wheels, as for example, colors and numbers. This is merely a beginning. We are pursuing it because we believe there is in this interrelationship of correspondential and representative forms a way of giving children and young people a means of seeing something of the beauty and power of the spirit in the Word. If this turns out to be truly a way, then there lies before us the task of selecting which natural forms are the most suitable to each age level, and providing a means of inter-relating this material into all parts of the curriculum. It's a wonderful and exciting challenge. How do we bring correspondences livingly and functionally into the curriculum? If only we can do this, we will retain the content quality of the course involved, but at the same time will give it a spiritual component. I have seen this in human body courses, both at secondary and elementary level. 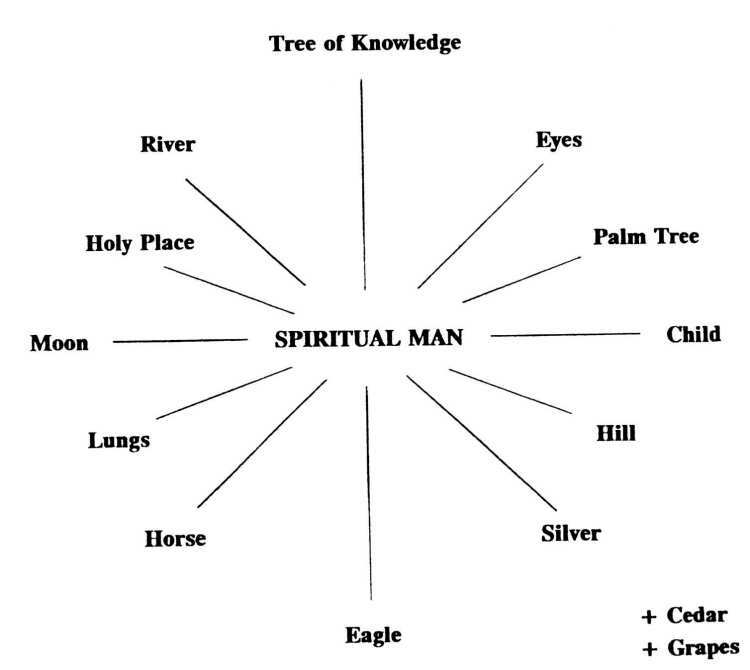 For example, correspondences are brought into the study of digestion, illustrating the acceptance of newly arrived spirits into the Grand Man of heaven. Seeing this dual aspect of course material and its correspondence to truths of the spirit has a powerful effect on the students involved; it marries functional faith to a science, and moves them strongly. One thing is clear: such integration of correspondences into course material is an art form -- an artistic challenge. For correspondences cannot be inserted as a cold scientific process, in a way that is unalive or non-functional. Spiritual and natural operations correspond functionally and beautifully. And both of these aspects need to be conveyed: beauty, and function. The Writings themselves give examples of correspondences in application, and they do this with almost a feeling of poetry. In the last section of The Divine Love and Wisdom, it is said that "from the correspondence of the heart with the will and of the lungs with the understanding, everything may be known that can be known about the will and understanding, or about love and wisdom, therefore about the soul of man" (394). The whole last section of DLW continues to pursue the correspondence of the heart and lungs, with many doctrinal points illustrated and explained through these correspondences. 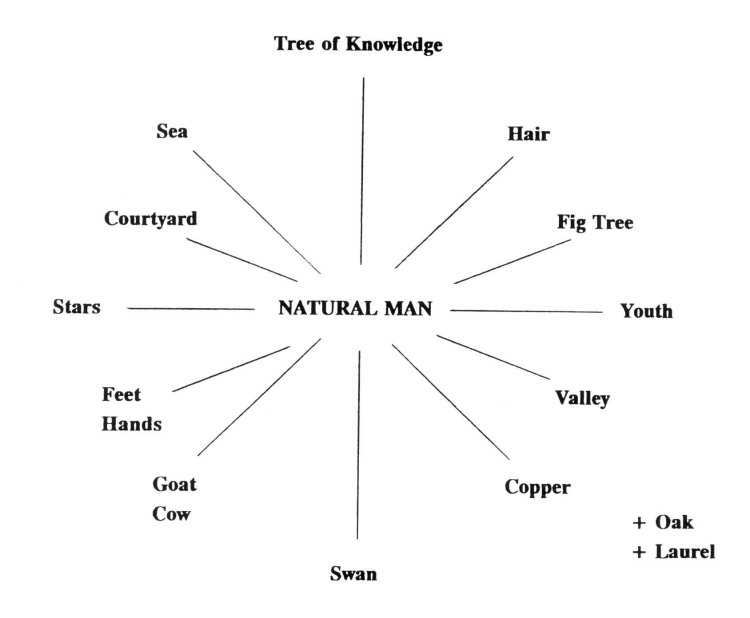 Another general illustration of correspondence in nature is the beautiful teaching in the trinal Word about trees, and about how their life cycles correspond to the regeneration of a human being. "The person who is being reborn begins like a tree from a seed, and also like a tree he produces leaves, then blossoms, and finally fruit; for he produces such things as are of intelligence, which in the Word are signified by 'leaves,' then such things as are of wisdom, which are signified by 'blossoms,' and finally such things as are of life, that is the good of love and charity in act, which in the Word are signified by 'fruits.' Such is the representative likeness between the fruit-bearing tree and the person who is being regenerated, insomuch, that if anything is known about spiritual good and truth, the nature of regeneration may be learned from a tree" (AC 5115:2). This reminds me of the poetry of the first Psalm: "Blessed is the man who walks not in the counsel of the ungodly, nor stands in the path of sinners, nor sits in the seat of the scornful. But his delight is in the law of the Lord, and in His law he meditates day and night. He shall be like a tree planted by rivers of water, that brings forth its fruit in its season, whose leaf also shall not wither; and whatever he does shall prosper" (vs.l -3). Such correspondential poetry brings to life the promise of AC 1807: 'There is nothing beautiful and delightful in the skies or on the earth, which is not in some way representative of the Lord's kingdom." portrayed that is the key. Celestial angels look to the inmost love or affection in the sense of the letter. In a curricular subject under study, it is the inmost use, or purpose that would be the key. And there must be a sense of artistry, a perception, to see this key. An example of such a search for correspondences is seen in the study of photosynthesis by Dr. Erland Brock. He writes: "Photosynthesis describes for us the conjunction of the elements hydrogen and oxygen from water obtained from the earth, with carbon from atmospheric carbon dioxide. The conjunction is made possible by solar energy, with chlorophyll serving as the means, through the provision of energetic electrons. And the product of this is food that permits the growth of the tree. By correspondential analogy, the input of solar radiation is clearly the influx of spiritual heat and light that proceeds as one from the spiritual Sun. ... The catalytic chlorophyll is, we suggest, the affection of truth, spoken of in the Writings ... With this love (of truth) from the Lord present with men, sense impressions from the natural world (water from the soil with trees) can be conjoined with influx from the spiritual world (carbon dioxide drawn from the atmosphere) to bring about the creation of knowledge (carbohydrate produced in photosynthesis), this serving as the raw material out of which the mind grows, as a tree does from the products of photosynthesis. And herein lies the basis of our humanity -- in the creation of knowledge and of the human mind thereby" (The New Philosophy, January/March 1986). What is needed to see correspondence functioning in course subject matter? First, the genuine doctrine revealed in the Writings -- the doctrine that governs the subject matter. Next there must be an accurate and clear description and understanding of the subject matter itself. The question then follows: what is the correspondence of each element in the subject matter involved? In the growth of a tree, such correspondences are revealed in the Writings. The correspondences of leaves, blossoms, and fruit are known. Knowing these correspondences, the relationship of regeneration and cycles of a fruit tree can be clearly, beautifully seen. But only if we know the general doctrine of rebirth, and the general knowledge of a fruit tree's cycle. There is one more vital element: enlightenment from the Lord, for which we pray. Sometimes we may think that if only we know the correspondences involved, then any natural subject matter can be turned by us into clear doctrinal lessons and illustrations. And this is true if the other three essential elements are also present: the doctrine within that applies, the facts of the subject under study, and enlightenment. With this four part harmony, the whole world of nature can gradually become correspondentially alive! Many correspondences are already revealed in the Writings, and this is the key in such cases. In myriads of other cases, such correspondences are not revealed. But we do know that there is nothing in nature that is not representative (AC 1807). Where correspondences are not revealed, what must be known is how the natural elements function together in the subject understudy. What role does each element play? Then, how do these work together in a scientific and artistic way? These things can be discovered by research and inductive study: how the elements work together, and what role each plays in this functioning. Then we can deduce the correspondences of each element. We need two other components: the frame-work of doctrines that applies to the subject under study, and we need enlightenment from the Lord. the Lord then bids us to go farther: to employ the science of sciences to gradually discover Him throughout creation, in ways that are artistically and scientifically fulfilling. 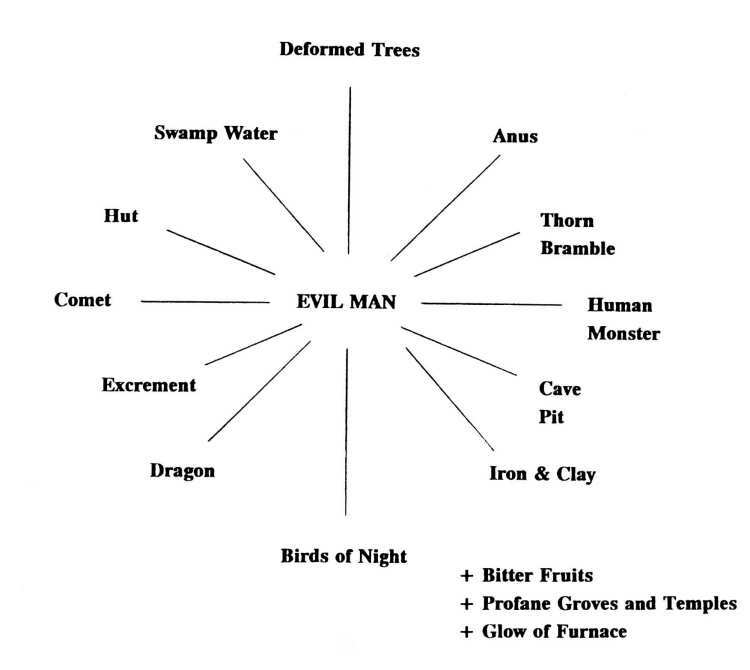 In early elementary school, this pathway of living correspondences is fairly evident and imagination-stirring. The sun, stars and moon; horses, lambs, lions and birds; minerals, jewels and metals; flowers, trees, and fruit -- so many things a child can see or grasp, and that can touch his imagination. Artistic and simple correspondential explanations of these symbols can have powerful meaning. Rocks, water, bread -- each of these can be living symbols to a child. Likewise the stories of the Word have so many correspondences filled with wonder and vivid representations. Children can live in a garden of Divine symbols. In the secondary schools this can be reinforced and built upon. The generals of the doctrines all have their ultimates in corresponding symbols in the Word and nature. The study of the spiritual world in the sophomore year is replete with the correspondences and representations that rule in heaven, the world of spirits, and hell. Divine Providence has its symbols in the Word and nature, as does the book Conjugial Love. And also in high school, correspondences can be introduced into the science and arts as well, as they have already been into the human body courses. The arts are ground awaiting the use of symbols that stir and uplift the imagination. Some of Andrew Wyeth's paintings convey this. In college, correspondences can begin to be introduced as a science. Its functional insertion into such sciences as physics and chemistry and biology is a good challenge. And in later college, surely the time is coming for a complete course in correspondences, representations, and significatives. The course formerly taught by Dr. Hugo Odhner called The Human Organic was the precursor to such a course. And a vast bibliography, a host of topics, await the teacher of this subject. Education is a lifelong process. In fact, it continues to eternity. Adults have the guidelines and doctrines revealed in the Writings for further exploration and use of correspondences and representations. The great background is the overall setting, the cosmology of creation. Bishop W. F. Pendleton spoke of certain universal principles revealed in the Writings that are "the origin of all the sciences and all the arts which we now possess ... (and which) must take their place in the higher education of the New Church as the head, the beginning, and origin of all the sciences." He lists these six philosophic doctrines (universal as principles) "correspondences, representation, influx, degrees, the spiritual world, and God as Man" (address entitled "The Future of the Academy," New Church Life, 1901, pp. 67-74). With these universal principles in mind, the adult explorer would then need a framework of doctrinal teachings that applies to and governs the subject under study. Prof. Bruce Glenn defines this as the "developing of related doctrines so as to form a framework of principles within which to order and interpret the knowledges of a subject" ("Distinctiveness in Action," address to the Academy Faculty, Nov. 4,1979 -- Academy Journal, Literary Number 1972-73, pp. 5-12). The book entitled The Academy: A Portrait illustrates such frameworks in particular subject areas: history, for example. other from nature or from the truths of nature. ... These two foundations of truth agree the one with the other, which is proved by a contemplation of certain things in the Word. Since sciences have shut up the understanding, therefore sciences may also open it; and it is opened so far as people are in good. ... All things of heaven have their foundation in the laws of order of nature in the world, and in man, so that the foundation is permanently fixed" (SD 5709). Laws then that govern specific sciences, arts, social sciences, psychology, philosophy, languages, etc., have their origin in spiritual laws that correspond and are directive. The challenge to the adult researcher or the college student is to have those six philosophic principles suggested by Bishop W.F.Pendleton clearly in mind, and then research and discover the framework of applied doctrinal principles that govern the specific subject field. With these as basic tools, the next search is to find the spiritual laws that are causative to the natural laws in the subject field. As an example of this, there are spiritual or Divine laws that govern history, and these are outlined in general in The Academy: A Portrait. Still missing in this effort to bring correspondences livingly into play are three remaining elements: a clear knowledge of the natural relationships and functioning of the elements in the subject under study, enlightenment, and the direct correspondences of each element. If the correspondences are revealed in the Writings, then the pathway is open. If correspondences are not revealed, there will be the need to deduce these from the functioning roles of each element in the subject being studied. This means there will be some enlightened guessing, and a lack of sureness. But such investigation is legitimate and very useful, if there is humility, and allegiance to the revealed framework of doctrines. The key element in any search to apply correspondences to the curriculum is enlightenment. And this is a gift from the Lord alone, to that person who is, first of all, shunning evils as sins, and looking to the Lord as one's Father. A second essential is to let the doctrines lead, not personal mental agendas. The cautioning is given by the Lord in reference to finding the spiritual sense of the Word; but this applies as well to the search for the inner symbolism of curricular course material. "Falsely thinks he who says to himself: 'I know many correspondences; I am able to know all the Doctrine of Divine truth; the spiritual sense will teach it.' This cannot be done in this way; but, as was said, it can be done if a person says to himself: 'I know the Doctrine of Divine truth; now I am able to see the spiritual sense if only I know correspondences.' But even then he must ... be in illustration from the Lord" (De Verbo 58). In a subject matter search for correspondential meanings, it isn't directly a spiritual sense that is sought, it is rather the corresponding spiritual laws. But the De Verbo 58 rules still govern this search. What a wonderful search and discoveries lie before us! As we work to find the genuine correspondences in curricular courses, we endeavor to bring the Lord's presence into our classrooms. We endeavor to bring the glory to the clouds. At the same time we are true to the subject matter being studied. The goal is to see that the Lord God Jesus Christ reigns throughout His creation. And this not only in universals, but in the wonderful particulars of correspondences. have ordained, what is man that You are mindful of him, and the son of man that You visit him? For You have made him a little lower than the angels, and You have crowned him with glory and honor. You have made him to have to have dominion over the works of Your hands; You have put all things under his feet, all sheep and oxen -- even the beasts of the field, the birds of the air, and the fish of the sea, that pass through the paths of the seas. O Lord, our Lord, how excellent is Your name in all the earth! (Psalm 8). The central idea of the doctrine of correspondences -- that the natural plane of existence is a clothing for the spiritual -- has an ancient lineage. In the context of New Church thought we date its roots to the Most Ancient Church. To others, the concept appears in various religious and secular contexts. But common to them all is that the idea has been with men since ancient times. Ideas that have no consequences in life soon lose their viability. Such could be the fate of correspondences in the New Church unless we actively seek applications in various aspects of our lives. It is with this in mind that we offer the following thoughts that have grown out of a lifetime of wondering about the subject, some focussed study of it (see accompanying bibliography), and stimulating exchanges in the summer 1991 Correspondence Seminar. This doctrine is central to a New Church philosophy of being, for it is by correspondence that the causal relationships exist between God and His creation, and between the finite spiritual and natural worlds. The following thoughts represent my sense of the functional significance of correspondences. The constant operation of the laws of correspondence is what sustains the physical universe and every part of it. They are as all-pervading in space and time as are the forces of nature; indeed it is through the operation of these laws that these forces (gravitational, electromagnetic, and nuclear) play the roles that they do in sustaining the universe. Thus correspondence is not a speculative idea that merely entertains the thought of philosophical types from time to time, but is a constant necessity for the continuity of all planes of existence. Our human qualities are made up of the thoughts and affections we have made our own in the course of living. These, the Word teaches, have their origin in the spiritual world, and they take on the forms they do through correspondence with their spiritual counterparts. So all our conscious and unconscious mental activity operates by laws of correspondence -- there is no escaping this; the constant ebb and flow of every moment of our being is governed by correspondence. Communication provides wonderful illustration of this, as the Lord notes in the Word. In body language, for example, such as a smile or friendly wave, we perceive the meaning of the physical act by the operation of correspondence. Extending this thought to communication in general, is not the key to good communication the ability to fashion natural things to best serve as bases or media for the expression of spiritual entities -- thoughts and affections? list is endless. This being the case, does it not imply that communication will be improved as laws governing correspondences are better understood? To the best of my knowledge, these laws have not been explored beyond their application in Biblical exegesis. Herein lies a challenge. Turning to fields of application already developed, we note that the concept of correspondence has had widest application in exposition of the internal sense of the letter of the Old and New Testament Word. Much of the Writings are, of course, devoted to this, and beyond them there are many volumes of exposition written for the New Church. Perhaps the next most developed application is in consideration of the Holy Land, as in Correspondences of Canaan by C.T. Odhner (1911; see bibliography for other titles). Interest in this field of enquiry persists to this day. Another arena of application is that of the human body. In this we have an extension of the kind of thought that is employed in the Writings, where bodily function and structure are used as a basis for the elucidation of higher ideas. Studies along these lines also persist to the present. In thinking about the application of the doctrine, the central idea to keep in mind is that it is the function of some physical entity that corresponds to something on a higher plane. Seeking correspondence in the form only leads nowhere -- an idea that the Lord makes clear in the Writings. This, I believe, is central to efforts to extend our appreciation of the natural world, as in science education, for example. Science instruction that is devoted solely to a consideration of how the world works from a material standpoint falls short of the mark. There is more to everything than meets the eye, and it is up to New Churchmen to increase our appreciation of this with increasingly deep penetration, not for the satisfaction of intellectual curiosity, but for the betterment of human existence both in the here-and-now, and to eternity. Extending this thought of application into all aspects of education, the principle that correspondences can be seen through function has universal application. The leading question beyond appreciation of the phenomena on the natural plane is "to what does this answer in the human mind?" The "what" here is the spiritual correspondent being sought. It is my belief that this applies to all elements in the curriculum. My final thought is that progress can only be made by application of the doctrine; we have had enough of talking and writing about it (as valuable and necessary as that has been), and must put our hand to the plough. Bibliography prepared in conjunction with a review study of the Doctrine of Correspondences by Erland J. Brock, summer 1991. This is by no means complete. It is drawn largely from The New Philosophy and New Church Life, and includes no references before 1883. It is taken to be fairly representative of thought on the subject. However, I look forward to the compilation of a far more extensive bibliography, to include articles and works that date back into the eighteenth century. Acton, Alfred. [Editor] "Swedenborg's Doctrine of Correspondences," The New Philosophy 20 (Jan.-April 1917): 12-31. _______ . "The Science of Correspondences," New Church Life 55 (August 1935): 241-254. Acton, Elmo C. "Correspondences, Representatives, and Significatives," New Church Life 34 (1931): 148-163. Allen, Aubrey T. "Sight, the Visual Process, and Doctrine" I, The New Philosophy 84 (Jan.-June 1981): 26-35; II, 85 (Oct.-Dec. 1982): 138-147. Allen, E. F. Philosophical Notes on Correspondences, The New Philosophy 79 (Oct. 1976): 505-510. Alden, K. R. "Correspondence," New Church Life 60 (Jan. 1940): 29. Anonymous. [?] New Church Life 27 (Sept. 1907): 529-532. _______ . "Three Views of Correspondence," New Church Life 28 (Oct. 1908): 611-613. _______ . "When and How to Teach Correspondences to the Young," New Church Life 29 (Sept. 1909): 522-524. _______ . "Notes by the Editor," The New Philosophy 35 (Jan. 1932): 1-5. _______ . "Representatives in Nature," New Church Life 58 (August 1938): 369-371. _______ . "Inventing Correspondences," New Church Life 59 (Feb. 1939): 70-76. _______ . "Correspondences Explained: Facts and Reasons Given in the Writings," New Church Life 67 (Oct. 1947): 466-471. _______ . "Swedenborg's 'Rational Psychology': The Panel Discussion," The New Philosophy 55 (July 1952): 333-349. Baker, G. L. "Limits of Knowledge: The Mechanics of Ignorance," in Brock, Erland J. et al. Swedenborg and His Influence. Academy of the New Church, Bryn Athyn, Penna., 1988: 187-198. Barler, O. L. "Queries Concerning Correspondence," New Church Life 26 (April 1906): 246-247. Bell, Reuben P. "A Study of Correspondence Focussing on the Book of Ezekiel," Studia Swedenborgiana 7 (June 1991): 5-25. Berridge, N. J. "Thinking from Correspondences," series in The New Philosophy: I. The Church as the Heart and Lungs of Mankind," 82 (Jan.-March 1979): 303-320; II. 'The Emotional Approach," 82 (Jan.-March 1979): 320-322; III. "Something about the will or Love," 82 (April 1979): 372-375; IV. "A Little Embryology," 82 (July 1979): 398-402; V. "The Union of the Heart and Lungs," 82 (Oct. 1979): 443-447; VI. "The Role of Bone and Marrow in Breathing," 83 (April-June 1980): 21-26; VII. "Some questions about the Eye," 83 (April-June 1980): 64-72; VIII. "Seeing and Understanding," 83 (July-Sept. 1980): 116-120; IX. "The Ears," 83 (Oct.-Dec. 1980): 149-156; X. 'The Decussations," 84 (Jan.-June 1981): 35-42; XI. "Olfactions and Odors," 84 (July-Dec. 1981):91-104; XII. "Digestion," 85 (Jan.-June 1982): 1-28. _______ . "The Natural Basis of Spiritual Existence," The New Philosophy 85 (Oct. Dec. 1982): 112-130. Bjorck, Albert. "Some Representative Events at the Lord's Birth," New Church Life 41 (June 1921): 334-346. Brock, E. J. "New Church Epistemology," Part I, The New Philosophy 87 (Jan.-March 1984): 253-262. _______ . "The Correspondence of Photosynthesis," The New Philosophy 89 (Jan.-March 1986): 45-54. Brock, Erland J., Heilman, Andrew J., Hyatt, Morna. 'The Doctrine of Correspondences Explored," Covenant 1 (Summer 1990): 79-89.
de Charms, George. "The Representative of a Church," New Church Life 95 (April 1975): 153-156. _______ . "Symbols, Signs, and Correspondences," New Church Life 98 (July 1978): 339-341. Cole, Stephen D. "Correspondences, Significatives, and Representatives." Dissertation: Academy of the New Church Theological School 1977. Glenn, E. Bruce. "Color: the use of correspondences" (letter to the editor), New Church Life 86 (Nov. 1966): 562-563. Griffith, Roy H. "Correspondences, Representatives, and Significatives," New Church Life 75 (March 1955): 127-135. Hite, Lewis F. "Swedenborg's Relation to Plato and Aristotle," The New Philosophy 35 (July 1932): 74-81. Iungerich, E. E."Is a Universal Mathesis One with the Science of Correspondences?" The New Philosophy 34 (Jan. 1931): 310-322. _______ . "The Ages of the Patriarchs, " ' New Church Life 33 (March 1913): 175-177. Jonsson, Inge. Swedenborgs Korrespondenslara. [Swedenborg's Doctrine of Correspondences] Stockholm: Almqvist & Wiksell, 1969. _______ . "Swedenborg's Doctrine of Correspondence," The New Philosophy 73 (April 1970): 299-327. Trans. from Swedish by Norman Sjoman. Junge, Robert S. "Correspondence and Education," New Church Life 95 (Feb. 1975): 57-64. _______ . "Comparison, Analogy, and Real Correspondence," The New Philosophy 78 (July 1975): 264-276. Karl, Valentine. "Glimpses of Spiritual Truth from the Writings of Paracelsus," New Church Life 33 (April 1913): 222-228. Lee, Sydney E. "The Message of the Rainbow," New Church Life 86 (July 1966): 313-327. Madeley, Edward. The Science of Correspondences Elucidated. Germantown, PA: Swedenborg Publishing Assoc., 1883. Odhner, C. Th. "Correspondences, Representation, and Signification," New Church Life 9 (April 1906): 239-245. _______ . 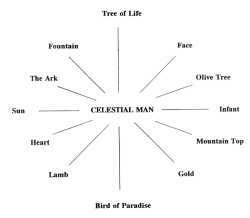 Correspondences of Canaan. Bryn Athyn: Academy Book Room, 1911. 160p. _______ . "Egyptian Monotheism," New Church Life 33 (Nov. 1913): 639-645. _______ . "The Correspondences of Egypt," New Church Life 34 (March 1914): 144-156. Odhner, Hugo Lj. "Notes on the Calendar Readings," New Church Life 50 (March, 1930): 166-171. ______ . "Christian Wolff and Swedenborg," The New Philosophy 54 (Oct. 1951`): 237-251. _______ . "Principles of the New Philosophy," The New Philosophy 68 (April-June 1965): 40-74. _______ . "Categories of Correspondences, " The New Philosophy 73 (April 1970): 332-346. Odhner, John L. "The Correspondences of Musical Instruments," The New Philosophy 81 (Oct. 1978): 292-301. Odhner, Linda Simonetti. "Correspondences of the Developing Human Form," The New Philosophy 88 (Jan.-March 1985): 447-471. Odhner, Ormond. "Correspondences, Representatives, and Significatives," New Church Life 86 (Nov. 1966): 551-558. _______ . "Correspondences in Marriage," New Church Life 91 (August, 1971): 375-378. Oyler, Philip T. 'The Science of Correspondences," New Church Life 50 (April, 1930): 209-218. Pendleton, N. D. "Representative Action and Verbal Inspiration," New Church Life 46 (Feb. 1926): 84-91. Pendleton, W. D. "The Doctrine of Correspondences or the Law of Communication," New Church Life 71 (Dec. 1951): 532-544. Pendleton, W. F. "The Credibility of Swedenborg's Science," New Church Life 21 (March 1901): 113-135. _______ . "Perfection by Correspondence," New Church Life 25 (July, 1905): 392-403. _______ . "Topics from the Writings," New Church Life 42 (June 1922): 305-311. _______ . "Topics from the Writings," New Church Life 43 (April 1923): 205-209. _______ . "Topics from the Writings," New Church Life 44 (Nov. 1924): 659-663. Pike, Wilfred D. "The Science or Law of Correspondences," New Church Life 47 (Sept. 1927): 523-528. Poole, George F. "Representative Worship in the New Church," New Church Life 45 (Sept. 1925): 556-557. Pryke, Martin. "Correspondence and Representation," New Church Life 82 (Sept., 1962): 415-431. Sandstrom, Erik. 'The Doctrine of Correspondences: Both Science and Philosophy," The New Philosophy 73 (Oct.-Dec. 1970): 379-393. Sandstrom, Erik E. "The Science of Sciences; a Unique Human Era," The New Philosophy 89 (April-June 1986): 77-97. _______ . "Borlung: the Rainbow Serpent," The New Philosophy 91 (Oct.-Dec. 1988): 661-667. Schnarr, Frederick L. "The Significations of Sleep," New Church Life 87 (July, 1967): 305-311. Simonetti, Linda. "The Human Form: Correspondences in Embryology," The New Philosophy 84 (Jan.-June 1981): 10-25. Simons, David R. "Seeing from Correspondence," New Church Life 78 (March 1958): 129-132. _______ . Unity in the Universe. Philadelphia, 1962. Smith, Gilbert H. "Correspondence and the Grand Man," New Church Life 59 (July 1939): 295-301. Soderberg, Allan C. "The Science and Correspondence of Disease," The New Philosophy 65 (Oct.-Dec. 1962): 85-93. Swedenborg, Emanuel. "Correspondences and Representations," Arcana Coelestia nos. 2987-3003, 3213-3227, 3337-3552, and 3472-3485. _______ . Heaven and Hell nos. 87-115, 485-490, and other nos. (see index). Tilson, R. J. "The Sacraments: Their Use and Power," New Church Life 49 (Jan. 1929): 19-34. The bibliography complied by Dr. Erland Brock includes a number of outstanding studies involving correspondences. Among these, for example, are: The Divine Allegory, by Dr. Hugo Odhner, The Correspondences of Canaan, by C. Th. Odhner, and many others. We asked the Correspondences Committee to send in further references that members considered outstanding, either in a scholarly sense, or for ready applicability. Fearfully and Wonderfully Made (A Surgeon Looks at the Human and Spiritual Body) by Dr. Paul Brand and Philip Yancy, 1980, Zondervan Publishing House, Grand Rapids, Mich. The Science of Correspondences Elucidated, by Edward Madely, James Spiers, 36 Bloomsbury St., London, England. 1902. The Science of Exposition, by W. F. Pendleton, 1915, The Academy of the New Church, Bryn Athyn, Pa.
1. In Agriculture, to improve soil fertility and food quality. Bio-dynamic Farming and Gardening association, Inc., P.O. Box 550, Kimberton, PA 19442. Phone:(215) 935-7797. In Business and Community Development, to create social structures that are use-centered and that foster true charity; contact the following institutions. NY 10977. Phone: (914) 425-0055. CA 95628. Phone: (916) 961-8727. 3. In Dance, contact The School of Eurythmy, 285 Hungry Hollow Rd., Spring Valley, NY 10977. Phone: (914) 352-5020. 5. In The Care of Developmentally Disabled Children, contact Camphill Children's Village, Beaver Run, Pennsylvania. Phone: (215) 469-9236. Those who have participated in the Committee work and in the Summer Seminar are generally agreeable to be consulted as resource people for teachers or students who wish to inquire further about doctrinal studies or applications. The contents of this booklet will give the inquirer indications about whom to consult in specific areas of interest. The General Faculty meeting on April 23, 1992, heard presentations by Andrew Heilman and Jonathan Rose on matters related to correspondence; and Stephen Cole will be giving a course on correspondence at "A Canadian Adventure in Learning" in August, 1992. These events are the culmination of the Committee's activities. The exact direction of the Committee in the coming year has not been determined as yet, although various activities and studies are in prospect. This booklet is only a beginning: a platform. It speaks of the philosophy of correspondences, definitions, application tools, and has some beginning applications and guidelines. The heartfelt wish of the Committee is that teachers and students will go on from here, and make their own classroom and curricular applications. Correspondences are a key to creation, to the Word, and to distinctive New Church education. But we are only in the infancy of making this knowledge, this "science," what it can be in our schools. A bit of a miracle awaits us!